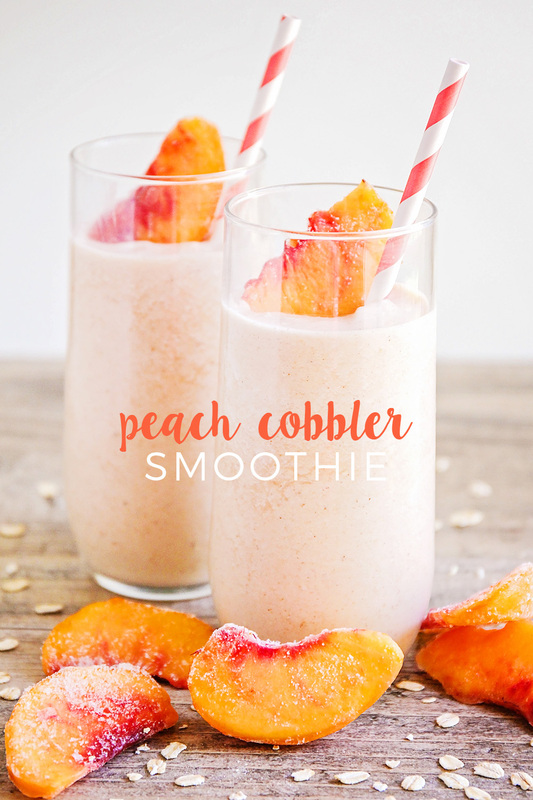 This sweet peach cobbler smoothie is a healthy and delicious way to start the day! Mornings are always hectic at our house. My kids' bus comes insanely early (7:27 a.m. Why?!?!? ), and I'm always running around like crazy, trying to get the kids out the door with something in their bellies. When we're in a hurry, but still want a delicious and healthy breakfast, smoothies are definitely the way to go. 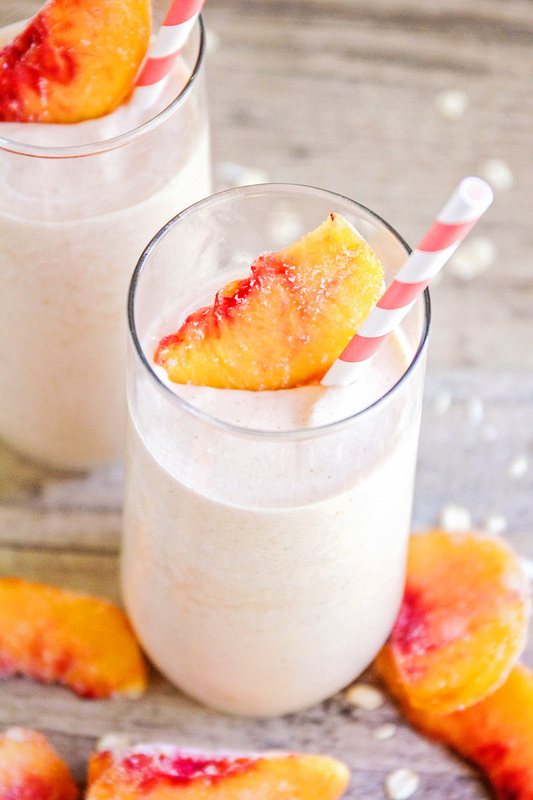 This peach cobbler smoothie is made with fresh peaches, cinnamon, vanilla, and honey, and tastes just like peach cobbler! It's also got oatmeal and flax seed to add a healthy boost and keep those kiddos full and satisfied until lunch time. It's a great way to start the day! My family is totally crazy about peaches. My mother in law has several peach trees in her back yard, and until we moved last year, she was gracious enough to share her bounty of peaches with us every fall. We usually bottled most of the peaches, but I was always sure to freeze enough of them to have on hand for smoothies. Her peaches are definitely something I miss about Utah! I think we're just going to have to buy peaches by the bushel from the fruit stands around here this summer, and do our best to freeze and bottle as many as we can for the cold months when we can't get fresh peaches. If you're lucky enough to have fresh peaches on hand, you can flash freeze them and use them in this smoothie; if not, frozen peaches from the grocery store will work just fine too! Add the peach slices, 1 cup milk, cinnamon, vanilla, oats, flax seed, and honey to a blender. Blend until smooth. Add additional milk as needed to reach desired consistency. Enjoy! Yum! I love a healthy smoothie to start my day, so this one will be made soon! Thank you!